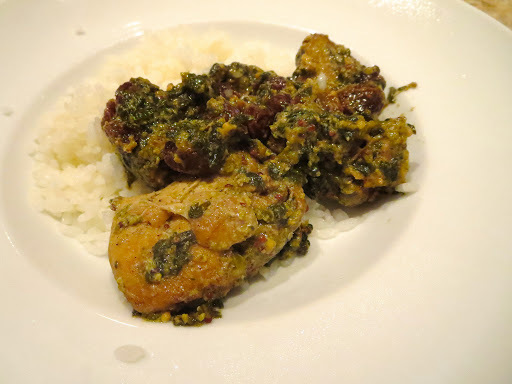 This is another one of my wife’s Indian-inspired chicken dishes. The recipe came from Madhur Jaffrey’s “Quick & Easy Indian Cooking”. We made some modifications especially instead of using whole spices such as whole cardamom pods, and sticks of cinnamon, we used the spices ground. The original recipe states that the whole spices are not to be eaten but once they are incorporated in the dish, they essentially disappear and we were a bit leery of swallowing them or chipping a tooth by crunching into them by mistake. In other recipes, we removed the whole spices after frying in oil but using the ground counter parts appear easier. We are sure this will be frowned upon. I asked my wife to take over from here. Chicken: We used thigh, 4 (about 2 and half lb) deboned, skinned and cut into large bit size. (Ground cayenne pepper, black pepper in original recipe, but we did not add these because we thought it would make the dish too hot). Spinach, 1 package (10 oz), steamed and chopped coarsely. In a large skillet or frying pan, add the vegetable oil and bloom herbs and spices including the bay leaves, cardamom, cinnamon, cloves, red pepper flakes and salt. Once the spices were fragrant, I removed the bay leaves and added the jalapeno pepper, and then whole grain mustard. I added yogurt, 1 tablespoonful at a time and mixing well after each addition to develop the sauce. I added the spinach and the chicken (without browning as per my husband suggestion that it only make the oil splatter but does not add much in terms of the flavor). I put on a lid and simmered it for 30 minutes. I finished by adding the raisins and cilantro. The sauce became rather thick. This is again very flavorful with layers of the many spices and cilantro but not too spicy hot and went perfectly well with cooked rice. We noticed, though, many spices such as cumin, cardamom, cloves are similar among many Indian dishes.